Butterfly Reflections, Ink. : Pinkfresh Studios Christmas in August! Pinkfresh Studios Christmas in August! Hi everyone! 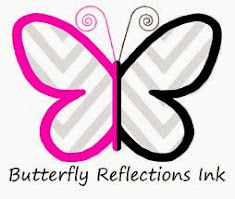 Lindsay here on the Butterfly Reflections, Ink blog today. 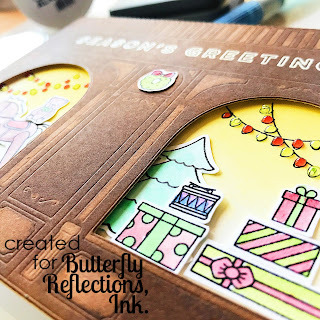 Now I know, it's normally Christmas in July, but I just recently got some of the cutest sets from Pinkfresh Studios and I just have to share them. 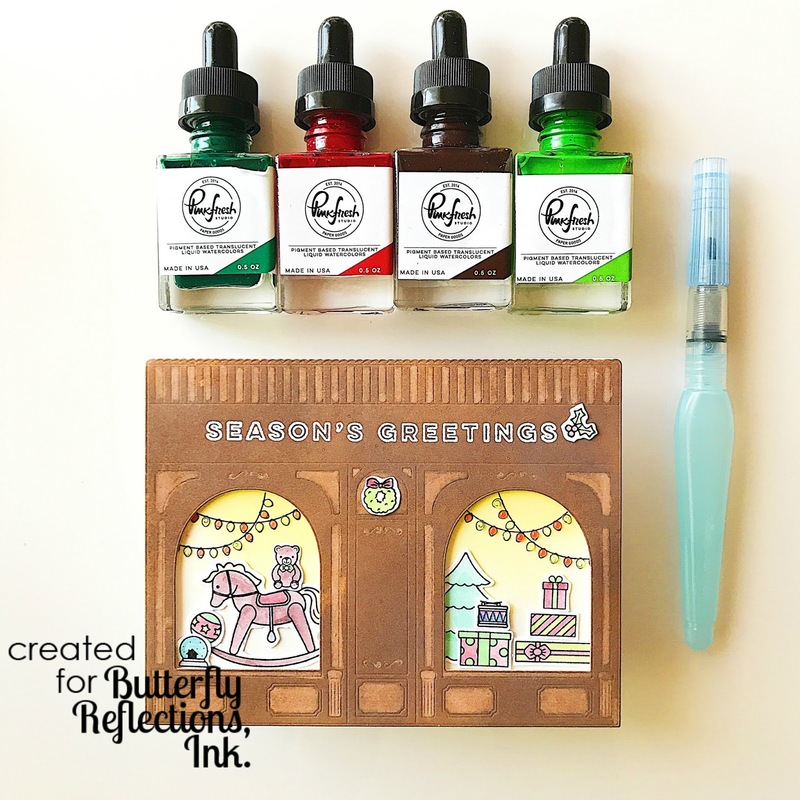 I mean, it's never too early for cardmakers to get started on Christmas cards, right!? For my first Christmas card of the season, I used Pinkfresh Studio's Merry and Bright Toy Shop Stamp Set and the coordinating Merry and Bright Toy Shop Die. This die creates an adorable store front in which you can place all of the wonderful elements from the stamp set. 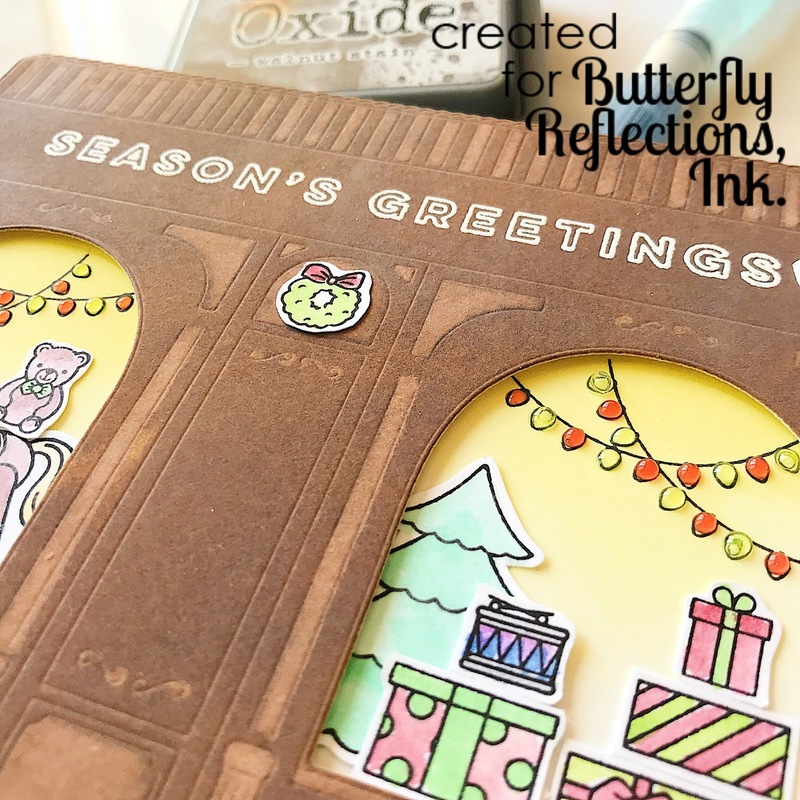 It also leaves you with a great space for a bold sentiment, also included in the stamp set. Before die cutting, I inked up a 4 1/4" x 5 1/2" piece of white card stock with Walnut Stain Distress Oxide Ink using a Mini Ink Blending Tool over the entire panel. 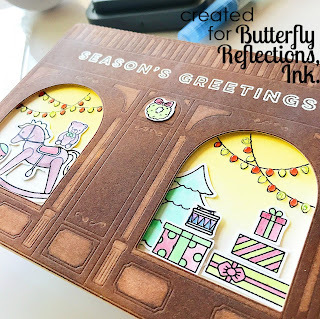 After die cutting the Merry and Bright Toy Shop Die, I used a Detailed Water Brush to add water to the details in the die cut. This causes the ink in those areas to react and change colors. I picked up the excess water with a paper towel and it really helped the details stand out against the inked up background. After that was all dry, I added my sentiment with Versamark Embossing Ink then embossed with Brutus Monroe Alabaster Embossing Powder and my Heat Tool. For the background inside the windows, I lined up another piece of white cardstock behind the inked and die cut background. I drew an outline of the windows with a pencil, so I knew where to ink the background and place the images inside the windows. I inked the inside part of the windows with Squeezed Lemonade Distress Oxide Ink to create an illusion of warmth within the toy store. 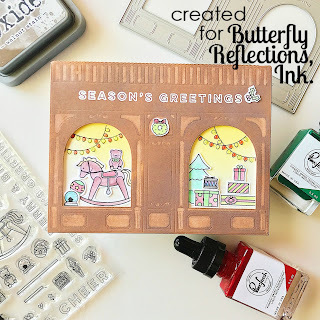 I then stamped the lights from the Merry and Bright Toy Shop Stamp Set using Versafine Onyx Black Ink. While I had the Versafine Onyx Black Ink out, I stamped all of the images from the Merry and Bright Toy Shop Stamp Set and colored them using the Pinkfresh Studio Liquid Watercolors. I stuck mostly with browns, greens, and reds to keep with a vintage, classic Christmas theme. I fussy cut out all the images using Kushgrip Spring Cut Detail Scissors and played around with the layout for a while. After finalizing where I wanted all of the images to go, I adhered them down with Mono Permanent Tape Adhesives and then added the toy shop front to the base with Foam Tape. As a final touch, I added Nuvo Jewel Drops in Key Lime and Strawberry Coulis to the string of light in the background of the windows. Thanks for stopping by today! 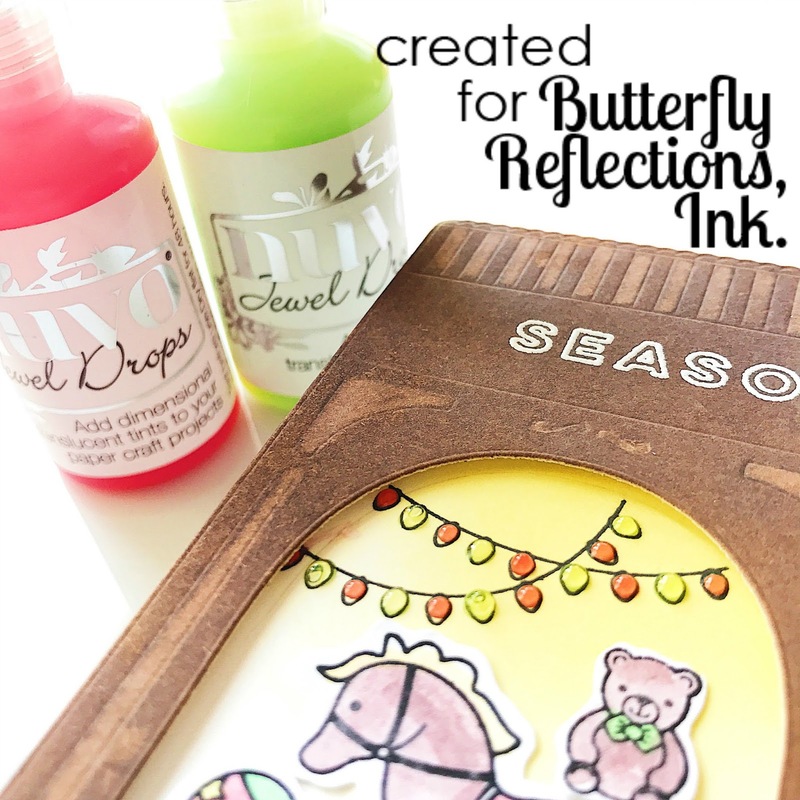 Maybe I've inspired you to get started on your Christmas cards a little early this year! Have a great week!